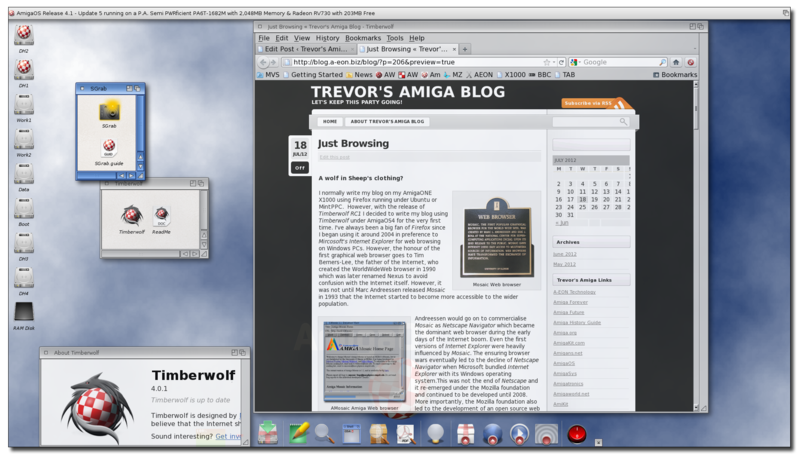 I normally write my blog on my AmigaONE X1000 using Firefox running under Ubuntu or MintPPC. 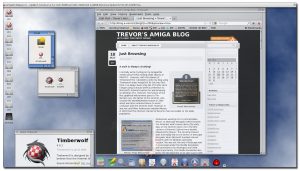 However, with the release of Timberwolf RC1 I decided to write my blog using Timberwolf under AmigaOS4 for the very first time. I've always been a big fan of Firefox since I began using it around 2004 in preference to Mircosoft's Internet Explorer for web browsing on Windows PCs. However, the honour of the first graphical web browser goes to Tim Berners-Lee, the father of the Internet, who created the WorldWideWeb browser in 1990 which was later renamed Nexus to avoid confusion with the Internet itself. 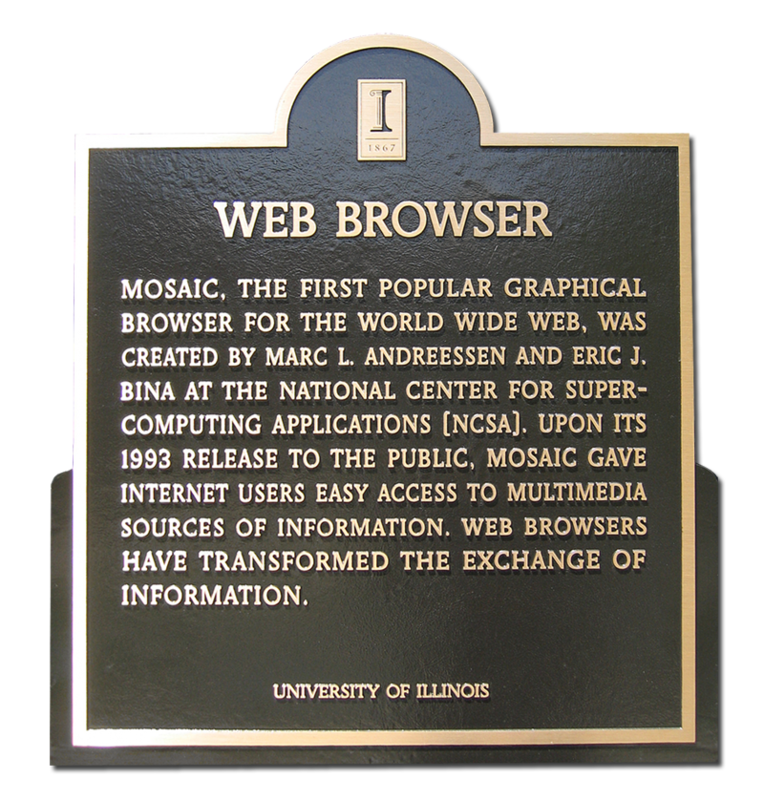 However, it was not until Marc Andreessen released Mosaic in 1993 that the Internet started to become more accessible to the wider population. Andreessen would go on to commercialise Mosaic as Netscape Navigator which became the dominant web browser during the early days of the Internet boom. 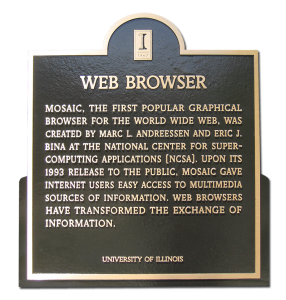 Even the first versions of Internet Explorer were heavily influenced by Mosaic. The ensuing browser wars eventually led to the decline of Netscape Navigator when Microsoft bundled Internet Explorer with its Windows operating system.This was not the end of Netscape and it re-emerged under the Mozilla foundation and continued to be developed until 2008. More importantly, the Mozilla foundation also led to the development of an open source web browser which started life as Phoenix in 2002 and is now better know as Firefox. Since it's introduction Firefox has steadily gained market share and now holds ~25% of the world wide browser market. Conversely, Internet Explorer has fallen from it 95% peak in 2002 to around 32% today. The other big winner is the Google Chrome browser which has grown to ~33% market share since it's introduction in 2008. You are probably wondering was this has all got to do with the Amiga? 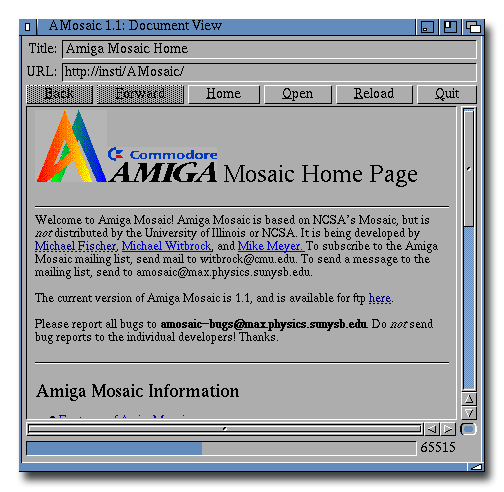 Back in 1994 I was using AMosaic which was Amiga port of the original Mosaic browser. Although it was buggy and unreliable it had a number of unique features and would eventually lead to development of IBrowse by Stefan Burström which was released in 1996. 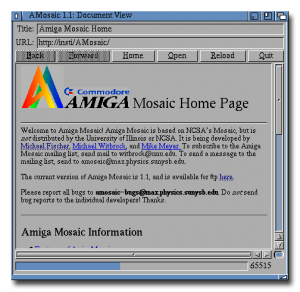 IBrowse was probably the most popular classic Amiga web browser. I used both IBrowse and AWeb on my A4000 and supported both while they were in development. But it was the MUI based IBrowse that was always my favourite. It was one of the few web browsers on any system that included tabbed browsing and when I discovered that Firefox had a similar feature it did not take me long to make the switch when browsing under Windows. Unfortunately, the development of IBrowse (and AWeb) effectively ceased in 2006/7. The Firefox source code is free software and under the Mozilla Public License anyone is free to view, modify and/or redistribute the source code. This has led to the development of Firefox ports on other platforms such as Flock, Miro, Iceweasel, and Songbird etc, which make use of the Firefox code. The Frieden brothers, under an AmigaBounty.net project, have created a port of Firefox for AmigaOS 4. For legal reasons it can't be called Firefox and has been given the name Timberwolf. I'm not a fan of benchmarks and prefer real life use so I decided to give the Timberwolf a thorough workout by using it to write this blog with WordPress on my AmigaONE X1000. Sometimes when I think about the amount of time and energy I devote to my Amiga "hobby" I think I must be totally crazy. 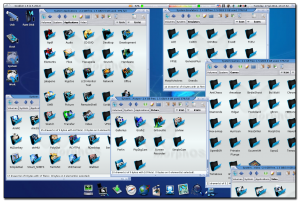 😉 Then I come across someone like French MorphOS enthusiast, Papiosaur, who has obviously devoted his life to creating Pack Ultimate for MorphOS ....... I realise that I am in good company! 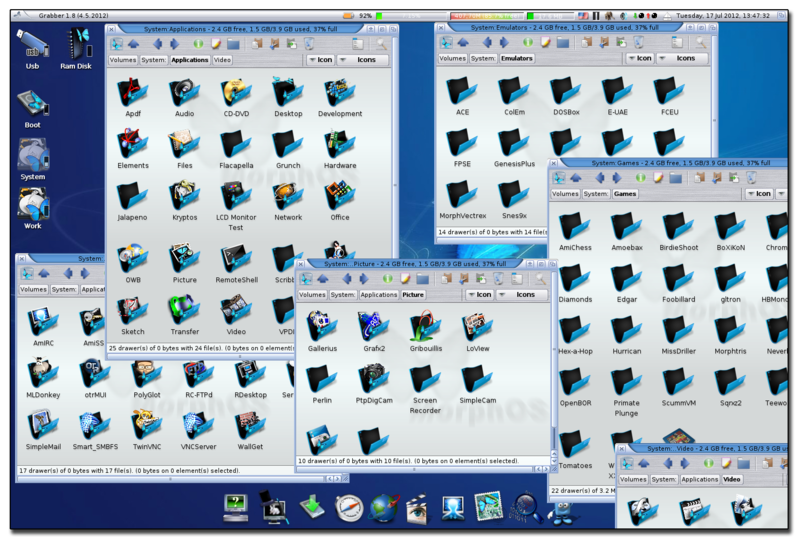 You may have read in one of my earlier blogs that Papiosaur, was working on an update to his Pack Ultimate, a compete pre-installed environment of software, games and utilities which can be installed under MorphOS 3.0. The new version, Pack Ultimate 3.0, was nearing completion and Papiosaur kindly send me a link to download his latest beta version to install on my "new' PowerBook laptop. I had installed MOS3.0 on my Powerbook but do not really have a lot of spare time to put it through its paces. 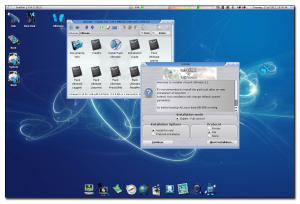 The initial installation of MorphOS is very lean and does not include a lot of additional software or application. This is where Pack Ultimate comes to the rescue. I downloaded the 515Mb ISO image and burned it to a CDROM using AmiDVD on my A1-X1000. AmiDVD is an excellent program and it's a shame that it is no longer being updated. Anyway, I inserted the CDROM into PowerBook's CD drive and double-clicked on the Ultimate CDROM icon. I then clicked on the Install Pack Ultimate icon and was presented with the initial installation screen which recommended installation on to a clean MOS system and warned me me to back up all my data. As I had not installed any software, other that my MOS3.0 licence key, my installation could not have been any cleaner so I made sure the Install for real button was checked and pressed Continue. I was presented with the option of downloading and installing a suite of True Type fonts which is needed. I selected yes and the fonts were automatically downloaded and installed. I was then given the option of choosing English or French language for contextual menus & Tool tips. I choose English. Finally I had to select where I wanted to install all the software. The default is the Sys: partition but I decided to select my Work: partition as I did not want to use valuable space on my smaller Sys: partition. That was my first mistake. Anyway, after that the installation is very straightforwards and precedes automatically with the occasional requirement to confirm the installation of the next section. It take quite some time as a lot of software is copied to your HDD. After the installation I was keen to see what had been installed and try out some of the software. I quickly discovered my earlier mistake. Many of the programs expected library files and to be present in the relevant directories on the Sys: partition. Without these files in the correct places many of the applications would not run. I quickly re-installed Pack Ultimate, but this time accepted the default Sys: location. The installation proceeded normally and after completion I rebooted the PowerBook. My previously lean, mean MOS3.0 installation had been totally transformed. The desktop layout now had a nice menu bar along the bottom complete with floating icons. The icon set had also been reworked, but it was only when I clicked on the top menu bar I realised that I now had access to literally hundreds of typical Amiga programs and utilities plus a few more. The only disappointed was that most of the 3D software (games etc.) that was installed does not currently run on the PowerBook due to a lack of graphics drivers. However, I assume these work OK on other MOS compatible hardware? Shortly after I installed Pack Ultimate 3.0, MorphOS3.1 was released. I performed a clean install of the new MorphOS version and attempted to re-install Pack Ultimate 3.0. Unfortunately, I discovered the installer was not compatible with MOS3.1. However, Papiosaur provided a quick fix along with a link to an updated Pack Ultimate 3.1 ISO. It wasn't long before I had the new version re-installed. Pack Ultimated 3.1 - "Locked and Loaded"
Cast your mind back to 1999. Do you remember when Jim Collas (Amiga Inc) announced that the next Amiga OS would be based on the Linux kernel? At the time the news caused mass outrage and dissent and not long after Collas departed the scene and by the end of the year Gateway had sold off Amiga Inc and the rest, as they say, is history. Back in 2000 a UK/NZ company called Rocklyte Systems introduced Athene, an object-based OS for PCs and embedded systems. It included a user environment which was constructed entirely from objects that were linked together at run-time and was designed to work in almost any software and hardware environment and could be reconfigured to suit the requirements of the target system, as well as individual users. Athene's object framework was multi-platform, allowing it to be used in Windows and Linux for the development of object-oriented programs. The user interface was completely rewritable and was capable of emulating other interfaces including the Amiga desktop environment. In 2004 Cloanto released the first version of its KX Light GNU/Linux distribution which was based on a modified version of Knoppix Debian. KX Light allowed the Amiga Forever CD to be used to boot a PC into an Amiga Forever Workbench 3.X without the costly Windows' overhead. This inspired the creation of X-Amiga which was released in 2008 and again used a minimal Linux operating system running E-UAE to boot up a fully featured Amiga Workbench in about 15 seconds. In recent year AmigaOS 4 users, have enjoyed Edgar Schwan's excellent AmiCygnix package which enables a native Unix environment to co-exist alongside AmigaOS 4. 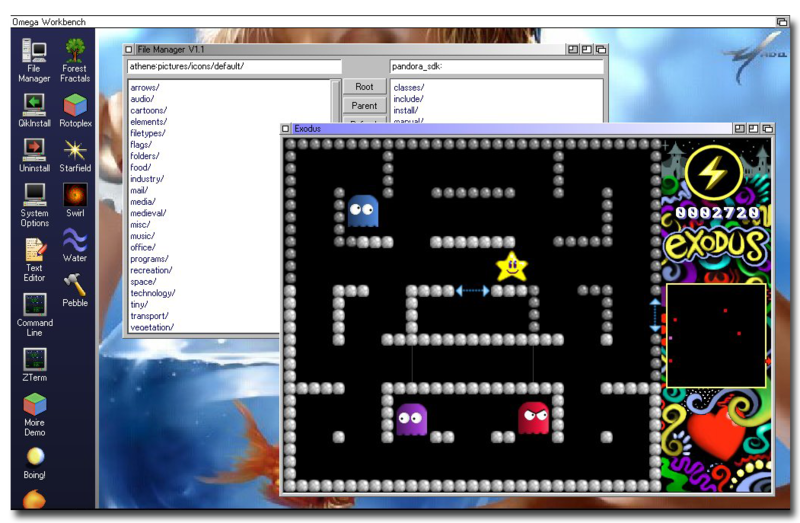 AmiCygnix is not an emulator and all Unix programs run as native binaries. 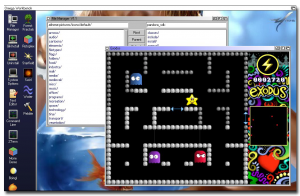 Edgar has ported some of the Unix GUI toolkits along with several heavyweight packages including the Abiword word processor, the Gimp graphics package, the Netsurf web browser and the Gnumeric spreadsheet. The original version of AmiCyngix had the desktop running on its own screen but the new latest version 1.1 allows you to run programs as standalone applications on the AmigaOS 4 Workbench. 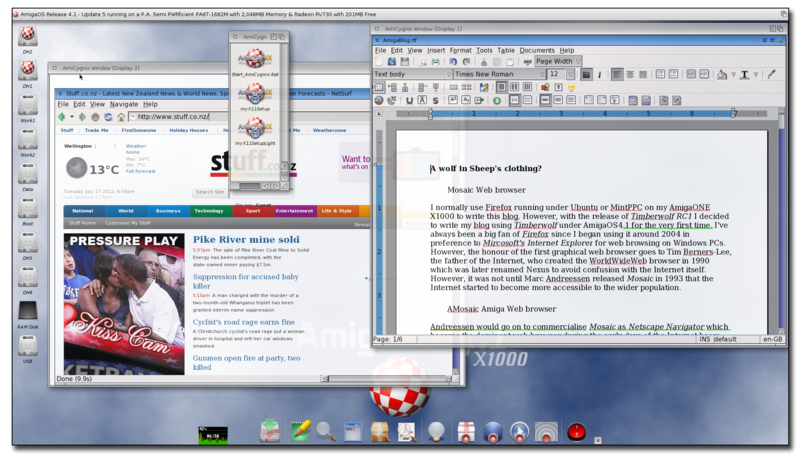 This is a major improvement and makes the Unix software feel an integral part of the AmigaOS. As an added benefit, on the A1-X1000 at least, moving the standalone AmiCygnix windows on Workbench is much smoother. It now seems that AROS wants to get in on the Linux act? 😉 Pascal Papara, the AROS guru behind Ares One and Broadway, has released an early version of his new AEROS OS which he describes as a hybrid distribution of AROS and Unix. The first version is based on Debian 6.0 and AROS Broadway and is available for ARM and x86 systems. Pascal claims that using the lightweight AROS on top of Linux gives users the best of both worlds. I decided to give AEROS a spin and downloaded the beta ISO. It can be run as a Live CD so I decided to run it under Ubuntu with VirtualBox. However, I got a blank OpenBox screen with no backdrop or icons. I could access the Linux file menus but it was not very exciting. I then tried with VMware on my PC but got the same result. Finally I tried the Live CD on my Ares One PC and it booted to an 800 x 600 display and I had full access to all of the Linux and AROS software that Pascal has included. I could not re-size the 800x600 desktop, which did not look good on my 1920x1080 monitor, and made it difficult to get a good feel for the software. After posting my results on AmigaWorld.net Pascal told me to set the "Virtual PC" at least 640MB RAM or more, as AROS gets 512MB of assigned and Linux needs some RAM as well. After upping the RAM size I managed to get the AEROS Live CD to boot under VMware. I then installed AEROS to a virtual HDD, again under VMware. The installation went smoothly but does assume you know how to set up partitions under Linux. An auto installation option would be much better for the novice user. 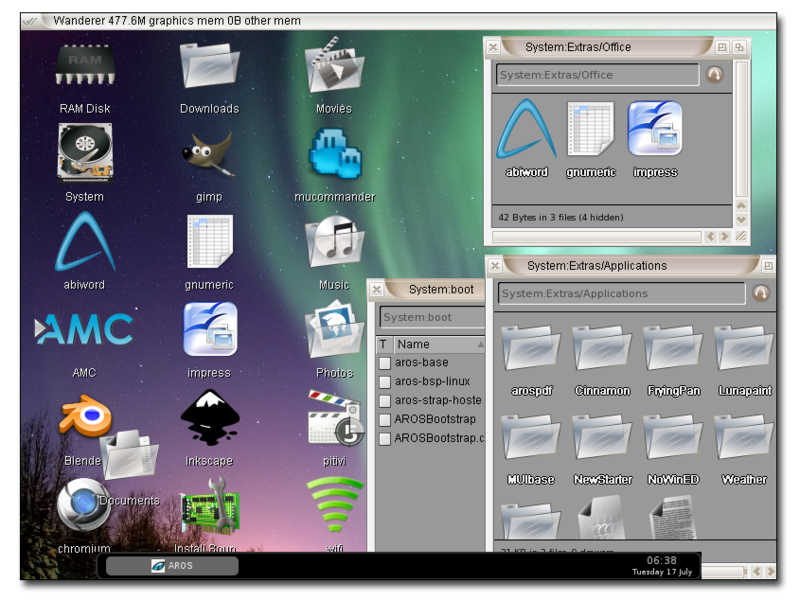 However, once it is installed you have access to a large assortment of AROS and Linux programs from the bottom menu bar and Ares dock icon. These include many of the standard programs and games found on a typically loaded AROS distribution. It even includes a demo version of AMC. Following my last blog, one eagle eyed reader contacted me to ask what the little red button was on the right-hand side of the AmiDock on my AmigaONE X1000 Workbench. Actually, I'm amazed what you guys "sometimes" spot in the pictures I post. 😉 It is a software SafeOff utility which allows me to power down my AmigaONE X1000 with the press of a mouse button. There is a 10 second delay and I can cancel the power down if I change my mind. Of course a software power-down is not required under AmigaOS but to switch off the A1-X1000 manually you must hold down the Power ON/OFF switch for ~4 seconds. I much prefer the software powerdown option. The SafeOff utility is the work of Darren Stevens and Alex Carmona who also produced an alternative PowerDown utility which sits in the background waiting for the power button to be pressed briefly. (not 4 seconds). When it is pressed the program sets a bit in the A1-X1000's PLD causing the machine to turn off. Again a 10 second countdown will be displayed and can be cancelled if needed. The PowerDown Icon is the work of Bill Eaves.